Not only is this the first time EVER, that a chef who owns a food truck is being featured in this event, but also, the first time that a female chef has been chosen to compete. The pressure is on for sure! I was informed by both, Eduardo and Taylor, that they were allowed to bring three ingredients from their own pantries to help them in their creative process. They were then able to graze the fresh, local pantry on premises, to collect ingredients to combine with their own. The pantry included basic items, such as: collards, beets, kale, eggplant, zucchini, jalapeno, sweet potato, onions, assorted peppers, lemons, and limes. I was able to get a sneak peek at both chefs’ items that they brought from home. Eduardo decided to bring avocado, corn masa, and one of his favorites, poblano peppers. Taylor’s items were coconut chili panko, curry powder, and orzo. Neither chef was informed of the secret ingredient until “go time,” making it difficult to know the exact direction that they would take in creating their dish. 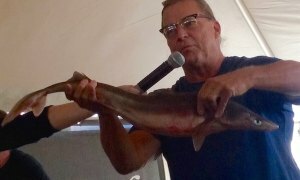 Bob Barris (a local real estate agent), was the emcee for the event today and said that he tried EVERYTHING, including “tickling, bribery, and even women” to coax Jeff Aiken (local seafood distributor) into giving him a hint as to what we could expect, with no luck. Jeff Aiken presents the secret ingredient! There was a rather large crowd surrounding the stage, including locals from both islands and tourists. During the competition, there were quite a few speakers. Amy Gaw (co-emcee) gave perfect descriptions of what we were witnessing on-stage, as well as background knowledge of our local seafood and working watermen. Guest judges included Rev. Richard Joyner, Jack Thigpen (NC Sea Grant program), and Ryan Speckman (co-owner of Local Seafood in Raleigh, NC). With fourteen minutes left, when asked how he was feeling, Eduardo replies, “Making magic!” as he tosses his veggies from the pan into the air. And with six minutes left, our chefs were about looking close to plating. Amy asks both at this point if they are ready.... Taylor replies, “just about”, and Eduardo replies with “ready for tequilla.” Always smiling and keeping that humor! (We would expect nothing else of course.) At the three minute mark…. both chefs are done! Plated in front of us are two beautiful dishes, that could not be more different from one another. Now we wait for judgement. 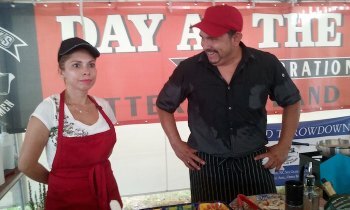 While the judge panel spent time tasting their dishes, a tasting tent was set up for the crowd. I must say, that I would not want to be at that table making decisions. Taylor’s dish consisted of pan-sauteed Dogfish, crusted in coconut chili panko, over orzo and eggplant with a sweet potato, beet and curry soup made with fishstock. Garnished with kale tossed in a citrus vinaigrette, Eduardo’s dish consisted of pan-sauteed Dogfish seasoned with salt, served with salsa, avocado, poblano pepper, steamed vegetables, and a freshly made corn tortilla. After the judges spent some time chatting and scoring…. they made their decision. 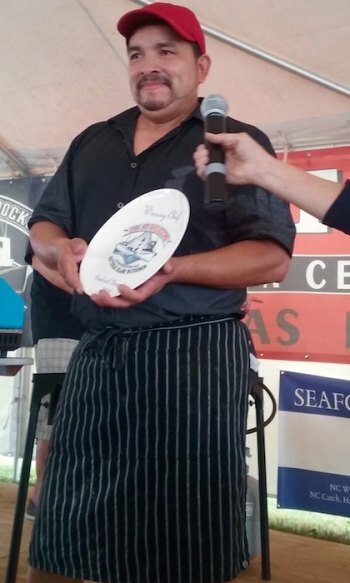 Ocracoke’s own Eduardo Chavez was announced the winning chef for the 2015 Seafood Throwdown!! Afterwards, we were able to chat briefly. 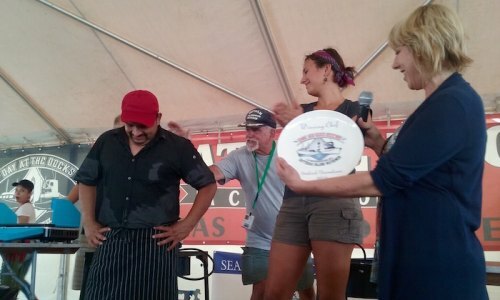 I was able to ask both chefs what they found to be the most difficult part of this challenge. Eduardo admitted to it being “the fish part.” And Taylor said she had a harder time with “being in front of such a large crowd.” Both should be very proud of themselves. I know that I feel honored to have witnessed this rare occurrence. 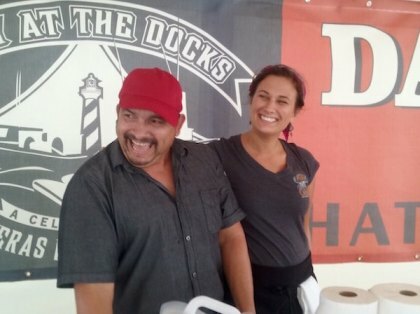 Congratulations Eduardo, you continue to make Ocracoke proud! Judges Rev. Joyner, Jack Thigpen, and Ryan Speckman dig in!